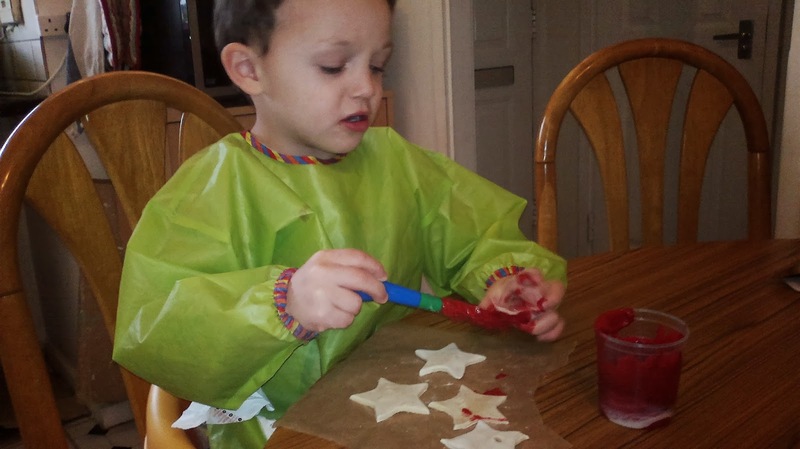 Making salt dough decorations is a firm favourite of a tradition in many families. I came across it for the first time last year watching 'Kirstie's Homemade Christmas' on TV and we had great fun, if not the most attractive results. This year we've refined our technique somewhat and have ended up with some prettier and less soggy decorations. This is a lovely activity to be done in ten minute bursts, which suits small children's attention spans. It encourages creative play, basic maths skills in measuring, and makes children feel good in contributing to the family's preparations for Christmas. If you don't celebrate Christmas, the activity is just as good for making fun decorations for any other festivity. The basic recipe is really simple. This year I used a recipe provided by my local children's center, but I halved the quantities as we ran out of table salt. 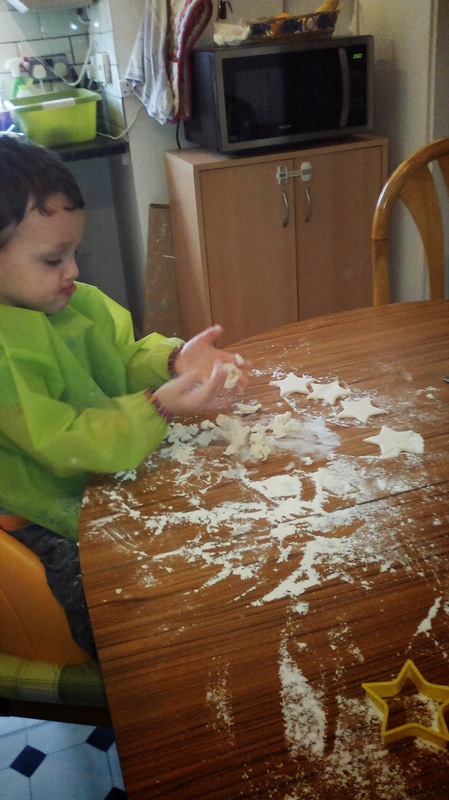 The children's center recipe: 2 cups plain flour. 1 cup salt. 1 cup water. Mix to form a dough (adjust quantities of water or flour to get right texture). Model into shapes (not too thick) and cook on a very low heat for several hours. The models can then be painted. The boys helped with measuring out the ingredients, which is really simple in this recipe as you use cups rather than weights. Don't panic if you don't have a standardised measuring cup (this is a more common measuring technique in America, here in the UK recipes usually give weights in grams, or ounces if it's an old recipe). Getting it right is about ratios, so as long as you use the same sized container as your 'cup' it doesn't matter - e.g. a 'cup' could be a half filled mug, or a plastic drinking cup, or a small bowl so long as you use the same thing for each measurement. From our experience last year, getting the dough rolled out fairly thin helps in the drying process later on. This needed surprisingly little intervention from me as both boys are becoming dab hands with the rolling pin. 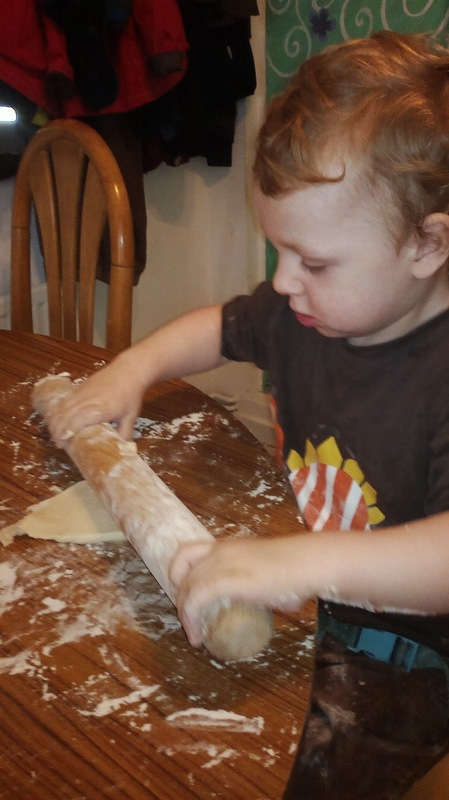 Sharing the rolling pin is something they were initially not keen on, but it all builds social skills. We then shared a star shaped cookie cutter to make the shapes, but any shape you have would work fine. I'd avoid anything with details that are too fiddly and liable to break off like the thin legs on reindeer shapes. I then put the shapes on a sheet of baking paper on a metal baking tray into a low temperature oven (about 80 centigrade). Before you put them in the oven don't forget to make a hole in each one if you intend to string them up - a skewer wiggled around to make a hole worked well, making the hole a bit bigger than you want as they tend to close up a bit in the oven. 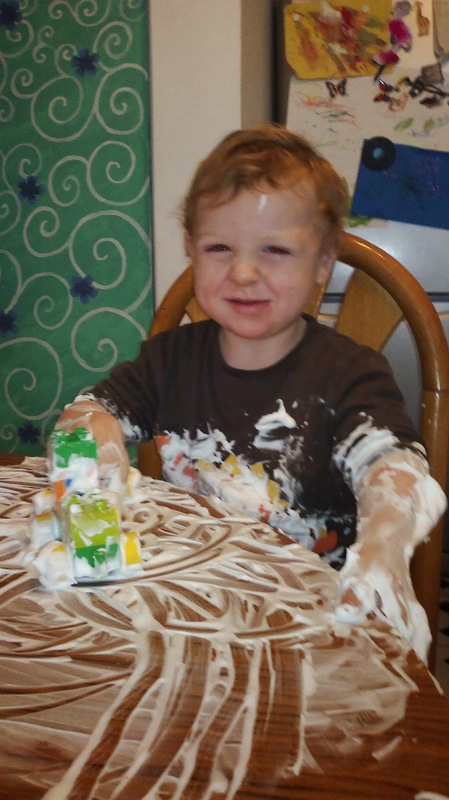 To make cleaning up the table more fun, we rolled straight into another messy play activity - rolling toy cars and trains through shaving foam. If you haven't read about this before, the 'value' cheap shaving foam has the least perfumes and is just soap, so even if your little ones ingest some it is pretty harmless - obviously avoid eyes and use your judgement about when your child is old enough to enjoy this. I find it helpful to have a clean damp flannel on hand for when one of them does get some in their eye. The next stage of the 'clean up' tends to cause even more mess, but the laughter is worth it. The boys get a cloth each to help wipe the table, and then a bowl of warm water on the floor to wash the foam off their toys. This usually ends up with the boys and the floor soaking wet, so to avoid slipping I try to be prepared with old towels and also supervise closely by getting down on the floor and splashing their toys with them. 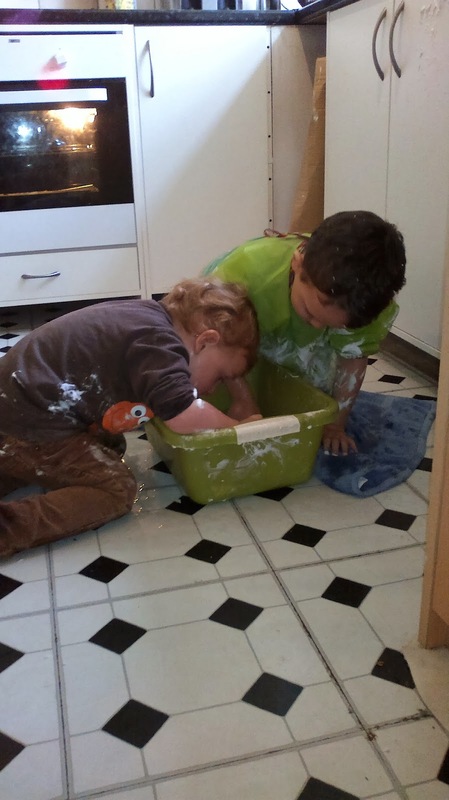 In this picture the we had floor was ideal for messy wet play. It was the old stick-on floor tiles that were underneath the floor we had to remove following our washing machine leak. I put down new laminate tiles yesterday, which I don't think will take so kindly to being really soaked so this phase of the activity will have to move upstairs to the bath in the future. The bath is where we end up anyway to make sure the last of the soap foam is removed and everyone is warmed up and dressed in dry clothes. I baked the shapes for 5 hours, then left them to dry outside the oven, then put them in again for another couple of hours. It has to be a really low heat as you are just drying them, not cooking them. We found last year that a higher heat just burns them in patches. This is the big reason for getting your shapes thin - uneven or thick shapes don't dry well. When the shapes were dry and cool we painted them with poster paint. This made the shapes a little soggy and cracked when it dried, so I'm sure someone will have a better alternative, but poster paint is child safe so I'm not worried about an imperfect finish. Besides which, the following day we then put so much glitter on the shapes it's hard to tell they were painted in the first place. The final stage (tomorrow) will be stringing them up on very thin ribbon, interspersed with some silvery metal charms we kept from some Christmas crackers. Another lesson from last year though - if you want to keep the shapes, put them in an airtight container with a desiccant added, for example a plastic tub with salt in it, or sachets of silica gel. We did not do this and stored them in a cardboard box in the loft with the other baubles. When we got the decorations down we had a lot of mushy dough shapes sticking the baubles together, oops!